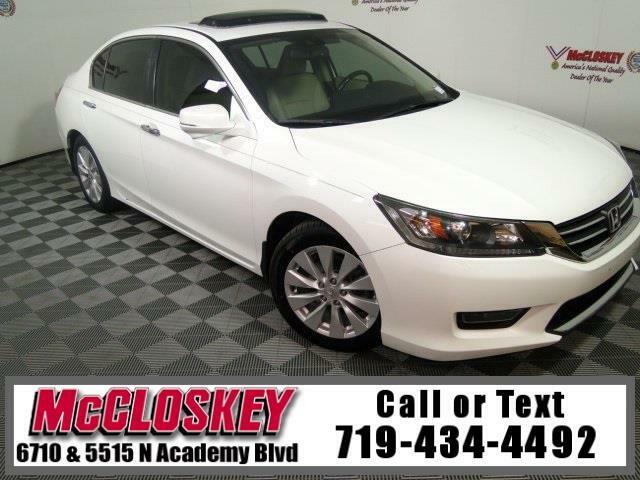 Pamper yourself in this 2014 Honda Accord EX-L with Keyless Entry and Ignition, Power Moon Roof, Heated Leather Seats, Backup Camera, Fog Lamps, and Much More! The EX-L trim adds leather upholstery, driver-seat memory functions, a four-way power passenger seat, heated front seats, forward collision and lane-departure warning systems, a more sophisticated rearview camera, an auto-dimming rearview mirror and a premium seven-speaker sound system with a touchscreen display, satellite radio and smartphone app integration (HondaLink). All 2014 Accords are front-wheel drive and most are fitted with the 2.4-liter inline four-cylinder engine, whether sedan or coupe. This engine is rated 185 horsepower and 181 pound-feet of torque. This vehicle passed our 110 multi-point inspection and is backed by our National Quality Dealer of the Year Award. We are an ''A+'' Better Business Bureau Rated Business. We offer low interest rate financing, low down payments and the highest trade allowances in the state! Here at McCloskey we do things a bit differently, we shop our competition every day to ensure a great value to you. Come on down and experience it for yourself. This McCloskey Assured vehicle includes a 2 month/2000 mile Warranty and a Vehicle History Report!! At McCloskey we strive to provide ASSURANCE, TRUST, VALUE AND QUALITY! Call 719-434-4492.